Senator Vicente Sotto III has filed Senate Bill 2344, which, if passed into law, will ban motorcycle pillion riders, also known as tandem- or back-riders since "they have become a menace to society." "Motorcycle back-riders, most commonly known as riding-in-tandem criminals, have an ample opportunity to commit heinous crimes with impunity because of the facility of getting away from the crime scene with the use of a motorcycle that can weave through even heavy traffic," the lawmaker said. "This bill allows law enforcers to flag down the riders and question them." According to the records of the Philippine National Police, more than 3,000 crimes committed in Metro Manila in 2013 alone could be attributed to tandem motorcycle riders. The bill provides some exemptions: (1) if the back-riders are the spouse, child or parent of the driver; and (2) if the riders are members of the Armed Forces of the Philippines or the Philippine National Police, who are on duty and in uniform. "This may be frowned upon by some members of society, but we have to think of the higher good of protecting the life and limb of our citizens," Sotto shared. Perhaps wary of the backlash the bill might receive from affected citizens, the senator stressed that the bill can be refined and debated upon on the committee level to make it responsive and effective in deterring crime. "Let's have an open discussion, argue on the pros and cons, and see where this leads us," Sotto added. 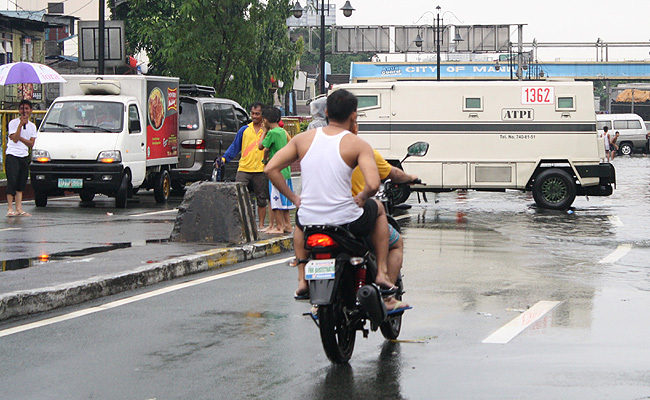 Senate Bill 2344 follows the ban implemented by the city of Mandaluyong recently, which also limits pillion passengers to the motorcycle rider's immediate family.